Ah, Stevie Nicks. She has, in my opinion, the coolest voice of all time amongst female recording artists. I mean, it’s just so unique and sultry and badass. From her work with Fleetwood Mac (the first record I ever bought was “Tango in the Night”) to her solo stuff, I’ve always been a fan. I’m used to hearing bands like the Rolling Stones cover this song, so it was a nice change to hear it sung by a woman. Stevie totally rocks it, and it’s one of my favourite tracks on the album. I’m gonna come right out and say this — I completely & totally love this version of ‘Maybe Baby’. Train…hmm, in the past I’ve always felt like I could take them or leave them (although I will grudgingly admit that ‘Soul Sister’ is a catchy number). But this cover is shiny and bright and awesomely poppy, and I think Pat Monahan’s voice was the perfect choice. Every time I listen to this I can’t help singing along and IT MAKES ME SO HAPPY!!!! As I said, Buddy Holly songs are joyful affairs. For example, even though this is a song about a girl that he loves more than she loves him & he’s trying to win her over (“It’s funny honey, you don’t care”) there’s a confident optimism to his lyrics (“When someday you want me, well / I’ll be there, wait and see”) and when he says “maybe” you know what he’s really saying is “definitely”. There’s no doubt in his mind that he is going to get this girl, because she’s the one for him. On first listen, this seems like a pretty straight-up cover version, without too many differences — but the more you hear it the more you realize the subtle changes & additions Brian Wilson has made to the song. I particularly like the inclusion of the vibraphone and the beautiful vocal harmonies (obviously one of Wilson’s fortés). Here’s what I’ve always said about covers: you’ve gotta make the song your own. There’s no point in just re-recording a classic song without changing anything. I mean, if that’s all you’re gonna do, why even bother? So I generally prefer it when a cover song is so different it kind of slaps you across the face, but I have to say that I am really appreciating the nuance and subtlety of this rendition. I knew very little about singer Imelda May before receiving this disc and listening to her version of ‘I’m Lookin’ For Someone to Love’. In researching her though I stumbled upon this amusing anecdote: her father used to drive her around to gigs when she first started out because she was underage (only 16). One particular evening, as she sat tearfully in the car after breaking up with a boyfriend, her dad turned to her and said “Is your heart broken? Excellent. Now you can sing the blues.” Ha. Well said, sir. Anyway, this one too is a fairly straight-up cover, but with the excellent addition of a trumpet and Imelda’s big, rockabilly-tinged vocals. You guys, I somehow just missed out on the whole Jackson Browne thing. My parents loved him, but I swear to god I couldn’t name any of his songs to you. All I know about him is that he was with Daryl Hannah, and then when she dated John Kennedy Jr. afterwards Jackie O disapproved of the match because she didn’t like how Hannah had allowed herself to be allegedly “pushed around” by Browne during their relationship. Um, way to blame the victim there, Jackie? I dunno you guys. Domestic violence is never a subject to be taken lightly, but when it comes to Hollywood I try to take the stories with a bit of a grain of salt. Anyway! Jackson Browne has a great voice, very smooth, and his rendition of this lovely ballad has a pretty, dreamy quality to it. So. While I generally appreciate Cobra Starship’s electro-pop vibe, there’s one thing that bugs me about this song: I don’t like the part when the girl comes in and sings from the point of view of Peggy Sue. I know I just said that I like it when a band does a completely different version from the original song, but I dunno you guys…maybe it’s just me, but I’m a big fan of the ‘love song with a girl’s name as the title’ subgenre, and I think that the whole point of that style of song is that it’s a way for the singer to express the bewilderment, heartache and loss he’s feeling now that the girl is no longer his. Therefore, to have the girl herself chime in is somewhat jarring. Try to imagine Donna turning Richie Valens’ song into a duet: “I am a girl, Donna is my name / Since I left you, you’ve never been the same”…doesn’t sound right, does it? Because if we get to hear Donna’s side of the story, then we get some closure…and then we no longer need to sing a song about her, right? Plus, it seems weird to have Peggy Sue sing “I’m Peggy Sue, and I love you / With a love so rare and true”…because no, apparently you don’t love him with a love “so rare and true”, Peggy Sue. That’s why you left him and broke his heart. Sob! Poor Buddy! But perhaps this is merely my own personal bias. It probably doesn’t help that I think that ‘Peggy Sue’ is pretty much the most perfect pop song ever written, so anything would have trouble measuring up to the original in my mind. Y’all, I think this is my favourite track on the compilation. Talk about recording a completely different take. This version sounds nothing like the original — and while the original is great, no complaints, this rendition is really beautiful. It’s a much slower version, contemplative and yearning, with soaring vocals and a rich, soulful arrangement. Hearing it sung this way really makes me appreciate Buddy’s amazing, romantic lyrics. Aw, Ringo. His voice always sounds so jolly, familiar and reassuring. Maybe it’s the whole Thomas the Tank Engine thing. Anyway, this is exactly how you’d picture Ringo Starr singing Buddy Holly. At 1:46 this is a short song, but it’s jaunty and peppy and I love the the hand claps. I don’t think there’s a song out there that wasn’t made better by the addition of hand claps. You just can’t go wrong. Did you ever watch Chris Isaak’s TV show? It was pretty good. My brother-in-law is a Chris Isaak fan and know he’s gonna like this song. This is the perfect tune for showcasing Isaak’s rich baritone and ultra-smooth delivery. It’s a slightly more dressed-up take than my fave version on the original, which was just Buddy singing with a single acoustic guitar for accompaniment — pretty amazing in and of itself. You guys, that’s the beauty & genius of Buddy’s music — the simplicity of his songwriting really lends itself to so many different possibilities for interpretation. I don’t mean that his music was lacking in sophistication, because it wasn’t. But it’s a real testament to his songs that they’ve been redone so many times and they still feel fresh and exciting 50 years on. This is another one of my favourites of Buddy’s. GREAT lyrics! Like I said before, I love the sense of confidence and self-assurance in his songs. I mean, how could you ever turn down a dude who sang these words to you? You’d have to have a heart of stone. A HEART OF STONE. Anyway, this cover was a huge hit for Linda Ronstadt in 1976 and although I think she does a good job, nothing will ever compare to the original for me. I really love Jeff Lynne. I think he’s a bit of a genius as a producer (Full Moon Fever, Traveling Wilburys, etc.) so I was delighted to see him included on this compilation and eagerly anticipated hearing his take on Buddy Holly. I was not disappointed. ‘Words of Love’ is yet another one of my fave Buddy songs, and I love Lynne’s version. I’m not enough of a musical expert to tell you with any convincing authority why this sounds exactly like a Jeff Lynne production (the guitars? the harmonies?) but it does, 100%. I never understood it when everyone was so shocked that Julia Roberts married Lyle Lovett. That whole ‘beauty and the beast’ thing was, frankly, insulting, because Lyle Lovett is the Man. He is a rad dude. I totally dig his cover of ‘Well All Right’. It’s a rollicking, countrified, spirited take on a great song. I loved 10,000 Maniacs back in the day, and Natalie Merchant’s haunting, soulful voice is an unexpected but inspired choice to cover Buddy Holly. The piano intro on this one is super pretty. This is another cover that’s quite different from the original, and I have to tell you that in general I really enjoyed the female artists on this album. I have one small bone to pick though (with the music industry in general): why is it that when a female singer is covering a song originally performed by a male, they always change the “she’s” and “her’s” to “he’s” and “his’s” (and vice versa if a dude is covering a girl singer)? I mean, I would not be weirded out by hearing a woman singing a song about a woman…would you? After all, there are lots of girls out there who could relate to that and I think they deserve some representation in song, do they not? If I ever have a band I am not modifying pronouns to reflect my gender. Songs about girls are so fun to sing and I don’t want to miss out on the experience just because I myself am a girl! It’s not about sexuality in my opinion…it’s about singing a song as it was written, not changing it just because you’re “supposed” to. Considering that ‘Everyday’ is the first Buddy Holly tune I ever heard, I approach covers of it with perhaps more trepidation than some of his other songs. I certainly don’t hate Patrick Stump (of Fall Out Boy)’s version here, and the inclusion of the marimba is lovely, but in my view it just can’t compare to the original. You might like it though. Let me know what you think. Speaking of girl crushes…not only is Zooey Deschanel a good actress, as well as being totally stylish and beautiful, but she’s married to Ben Gibbard of Death Cab for Cutie and she collaborates with M. Ward in their band She & Him. Could this girl get any cooler? Apparently, yes — because she has a great voice and this is like the 3rd Buddy Holly cover of hers that I’ve heard (she and M. Ward do an excellent version of ‘Rave On’ on his superb album Hold Time, which I urge you to check out). She seems to be on everyone’s radar when it comes to reinterpreting Buddy — obviously a compliment of the highest order. Hahaha. Oh, Eric Idle of Monty Python. Can I just tell you that I love your hilarious, irreverent version of this song, and I think it’s the perfect way to cap off this delightful tribute album? Well done, sir. Well done. Full points for originality. So, final verdict? This is an excellent compilation that hangs together nicely. I definitely enjoyed it more than the other Buddy Holly tribute that was released recently, Rave On Buddy Holly. Though that album had some standouts, I found it a bit scattered as a whole. Listen to Me: Buddy Holly is much more cohesive and frankly an absolute pleasure to listen to from start to finish. It’s been on heavy rotation on my iPod all week and I don’t see that changing anytime soon! Full disclosure: I received my review copy of Listen to Me: Buddy Holly from eOne Music Canada. I received neither money nor any other compensation for this review. 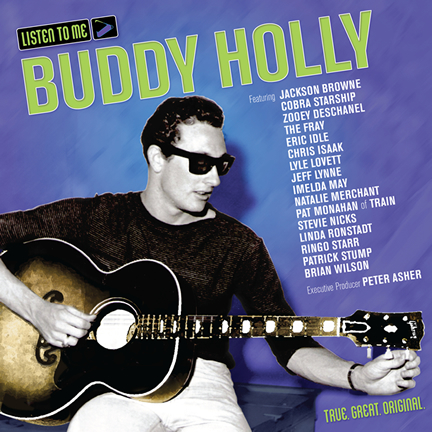 Listen to Me: Buddy Holly is available in stores now. This entry was posted on Sunday, September 25th, 2011 at 9:09 pm	and tagged with covers, gone too soon, mad skills, nostalgia and posted in Album Obsessions. You can follow any responses to this entry through the RSS 2.0 feed. Ahh Buddy.. triumph and tragedy.. energy, innocence and taste to burn..
Congratrulations what a great site, I also enjoy Buddy Holly, his music is everlasting for all ages. I remember when I was a teenager he was a gavourite. Truly his music is inspirational and will be here forever..